Ceramic Therapy Magnets are most commonly used on biomagnetism which can be very accesible since you can find them in your local hardware store. The most popular ones are the type that have the shape of dominoes, and they usually are sold by pairs on regular retail stores for $2.50. Another great option is buying them in bulk from Amazon, which usually carry good deals. These particular ceramic magnets carry a gauss measurement of 3,000. These ceramic magnets are made out of hard ferrite magnet material and they are 1 7/8 inch x 7/8 inch x 3/8 inch with about 3.5 lb pulling force. Once you get hooked on practicing biomagnetism as a health alternative you are going to prefer to have your magnets covered with either colored goat skin, which may not be to easy to find, but simple colored duck tape will do. The idea of using red and black tape is to have a clear idea which pole is the negative (North) side or positive (South) side. It is very important to be absolutely sure which side is positive and which negative so that in the future you might cover some other magnets with the correct polarity. How to check the polarity of a magnet? You can use a compass to tell the poles of a magnet. The swinging needle on the magnet will be attracted to the south pole and will be repelled by the north pole. This is because compasses work by attracting the Earth’s North pole. When you put a magnet next to a compass, it interferes with the magnetic field of the earth and attracts to the much stronger force of the magnet. 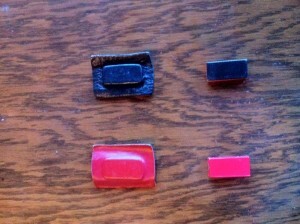 Ceramic therapy magnets come in many shapes and sizes, and can be useful for particular applications. 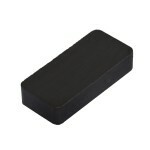 Hard ferrite ceramic magnets do break if dropped, or if they are snapped together in a strong manner. Always be careful when handling magnets, specially children should avoid playing with strong magnets. Ceramic therapy magnets can also be used to magnetize water using them as coasters. This particular size of ferrite ceramic magnet is great to cover large areas of the body where they can provide a large contact area that needs to be treated. A good example is back pain, where you can place them with the negative side towards an area of your back while you are laying down on a bed, massage table or couch. 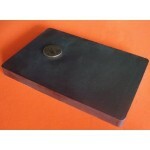 The ceramic hard ferrite magnet shown in the pictures is 6″ x 4″ x 1/2″, weighing 3 lbs. Having a pull force of 32lbs, and a Gauss reading of 3,850. This is a massive magnet which should be handle with extreme care. Due to the strong force and area of contact, you have to be very careful of not snapping them together and getting your fingers in the way. It is a good practice to slide them between each other if you want to pile them up. Always be aware that children should not be handling these type of heavy magnets and using them as toys, since they can very easily get pinched or hurt if not handled properly. Ceramic therapy magnets do not need to be extremely powerful in order to be effective, 1,000 Gauss of power is enough to be considered a good therapy magnet for biomagnetism. Other type of magnets like the ones made of neodymium, can also be considered for therapeutic use, we will extend that information in a future post, where we will analyze all the different versions and types available in the market. If you are interested in learning more about magnets and their properties, visit Wikipedia.